Food Technology Handbook from C.H.I.P.S. Improving the Fat Content of Foods addresses both the influence of dietary fats on health, and practical strategies for improving the fat content of food products. Part 1 reviews the evidence on the links between dietary fats and health. There are chapters on the links between saturated fatty acid intake, obesity, coronary heart disease, diabetes and cancer, as well as the health benefits of monounsaturated fats, polyunsaturated fatty acids (PUFAs) and conjugated linoleic acids (CLAs). Part 2 then discusses ways of reducing saturated fatty acids in food. 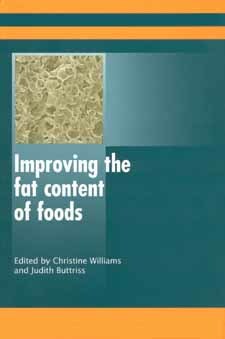 It includes chapters on the role of lipids on food quality and ways of gaining consumer acceptance of low-fat foods, as well as chapters on improving fatty acid composition in dairy products and milk and the use of fat replacers. Part 3 reviews ways of using polyunsaturated and other modified fatty acids in food products. It includes chapters on developing and using PUFAs as functional ingredients and ways of improving the sensory quality of products incorporating modified fats.